I woke up on Election Day ready to get the whole thing over with. My life was already in a state of transition: the eco-village I’d lived in for two years was on the of cusp of disbanding. The new collective house I was moving into into had a lot of things to get in order: Core values to agree upon, bulk food orders to place, rooms to fill. The presidential election felt like a distraction. There had been some debate among my friends about the future of our country. But for the most part, we agreed: the real work to be done was local, regional. We felt sure that when the votes were tallied, it would be easier, not harder, to do the work of community building that we had before us. So my house made plans for a visioning session at noon on Wednesday, the day after the election, expecting it to be a day like any other. Instead, we woke up sick to our stomachs. I could barely get out of bed or hold down breakfast. I curled up on the couch while my housemates read the “rooms available” ad we were planning to share with our networks that afternoon. Our core values – non-violence, sustainability, diversity – seemed hopelessly idealistic. I was afraid that my housemates would bail on the whole thing and talk seriously about moving to Canada. But the more we talked, the more it became clear: we needed this community more than ever. We needed a refuge, a network of friends and allies to reinforce our values and remind ourselves what we were worth fighting for. I found myself tearing up, not at how bad things were going to get, but how good things could still be – if we listened to, and cared for, and supported each other through the months ahead. Yes, some of the things we’d taken for granted – our jobs, our health insurance, some of our rights and freedoms – suddenly seemed more fragile. But our community felt stronger. Our values were intact. Our determination hadn’t wavered. We had a responsibility, not just to ourselves, but to our friends and families who weren’t yet living in community, to practice, refine, and model and this way of life. In countless Facebook posts and news articles, I’ve been hearing the same sentiments: that change won’t come from the top-down, but from local political movements and resilient regional networks. Now is the time to buy, shop, and eat local. To push for sanctuary cities that refuse to accept racism as a way of life. To pool our resources. To share our incomes. To explore new ways of forming families and relationships. To make space for creative expression. To barter and trade. To co-parent. If you’ve been on the fence, now is the time to join or start an intentional community of your own. Or, if you’re able, support FIC with a donation to our fall fundraising drive to help spread the message of communal and collective living. This year, we’re going to need cooperative culture more than ever. Let’s extend that invitation far and wide. How have you relied on your community networks since Election Day? 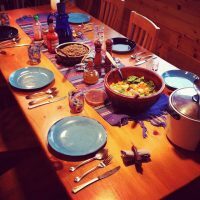 If you aren’t yet part of an intentional community, why not reach out to one and see if you can share dinner with them this holiday season?